University Hospital is the flagship teaching affiliate for Rutgers NJMS. UH is a separate, independent medical center with 519 licensed beds, an active medical staff of more than 600 and more than 3,100 employees. It is a regional resource for advanced care in a wide range of medical specialties. It is home to northern New Jersey’s only Level I Trauma Center and to specialty programs such as a Stroke Center, CHF Center, STEMI Center and a Center for Liver Diseases. The hospital accommodates about 20,000 admissions and 2000 births annually. There are over 215,000 outpatient visits annually. 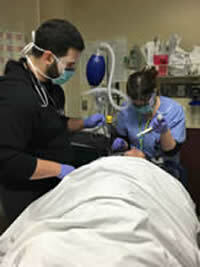 Trauma: As the only Level 1 Trauma Center in Northern New Jersey, we provide cutting edge trauma care. 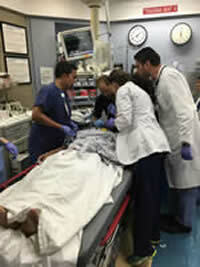 The ED manages trauma cases independently or in conjuction with the Trauma Surgery team for the more serious cases. There are 4 Trauma Bays as well as a shock-trauma room that may be used as an operating room. Each bay is fully equipped for complete trauma resuscitations including radiology-friendly stretchers. Designated plain film radiology and a ct scanner attached to the area provides quick and efficient radiological studies. Pediatric ED: The Pediatric ED consists of 10 monitored beds, a 6 chair asthma room and its own waiting room. A designated resuscitation room is equipped with all the necessary equipment to run an efficient pediatric code. Psychiatric ED: A dedicated Psychiatric ED with 6 individual rooms supported by dedicated Psychiatry staff (providers, screeners, etc.) in addition to emergency physician coverage is part of the ED complex. Mid-Track: This area holds up to 10 patients, with a dedicated Gynecology room and an Eye room. The area cares for middle acuity patients and is staffed by attending emergency physicians and nurse practitioners. 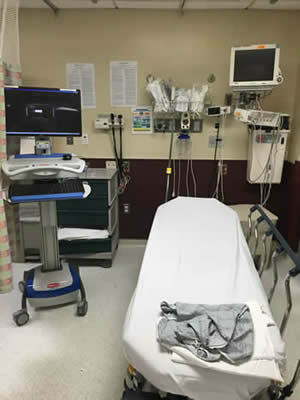 Fast-Track: Equipped with 8 beds and a well-equipped Eye/ENT room, like the rest of the ED this area operates 24/7 and sees lower acuity patients. The area is primarily staffed by nurse practitioners with emergency physician support. 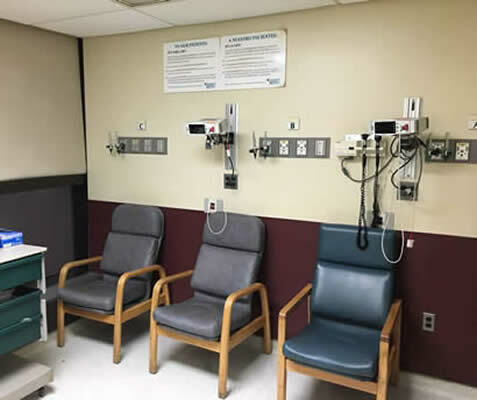 Radiology: Radiology is located immediately adjancent to the ED, incorporating 4 x-ray exam rooms, an ultrasound suite, two dedicated multi-detector helical CT scanners, and Lodox imaging system installed in our trauma room. MRI and 2 angiography suites are also located within the radiology suite. All ED radiologic images are digital and can be accessed within the clinical areas by computer. Radiology attendings or residents are available to read studies at all times. University Hospital also receives patients via air transport, the Northern Shock Trauma Air Rescue (NorthSTAR). Together with our ground-based critical care transport service and our University Hospital-based fleet of EMS ambulances, the University Hospital provides the people of Newark and New Jersey with state-of-the-art emergency medical care. Medical Control for EMS and for Northstar is provided by our residents and attendings. EKGs of suspected AMI patients are transmitted via telemetry to the ED and to cardiologists on call. When stroke patients, trauma patients and patients with acute MI are en route, our dispatchers notify the ED and appropriate teams so that prompt care can be delivered.